UCHealth strongly encourages you to contact a financial counselor at 970-495-7222 to discuss payment options prior to receiving a health care service from a UCHealth facility, since prices for health care services posted on this site may not reflect the actual amount of your financial responsibility. 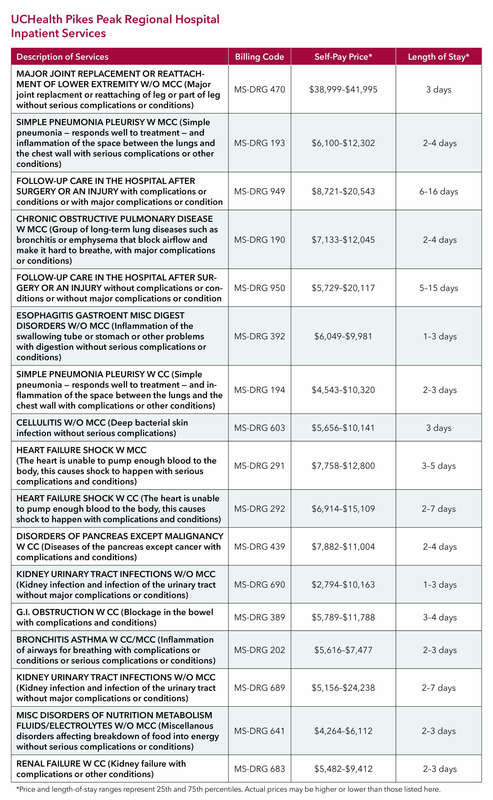 The pricing information on this site reflects the typical price for uninsured or self-pay patients for hospital services. 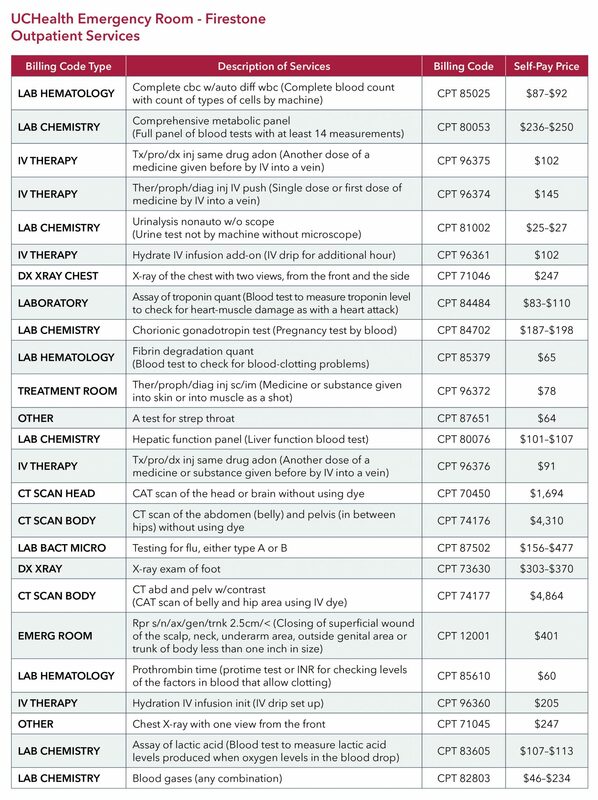 All prices posted on this site already reflect the hospital’s uninsured discount. 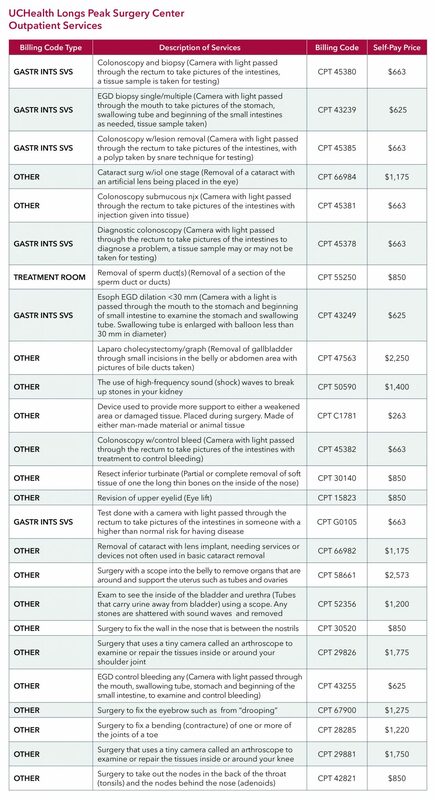 The prices do not reflect additional financial assistance discounts which patients may be eligible for. In most cases, physicians providing you with services related to your hospital stay or visit will bill you separately. 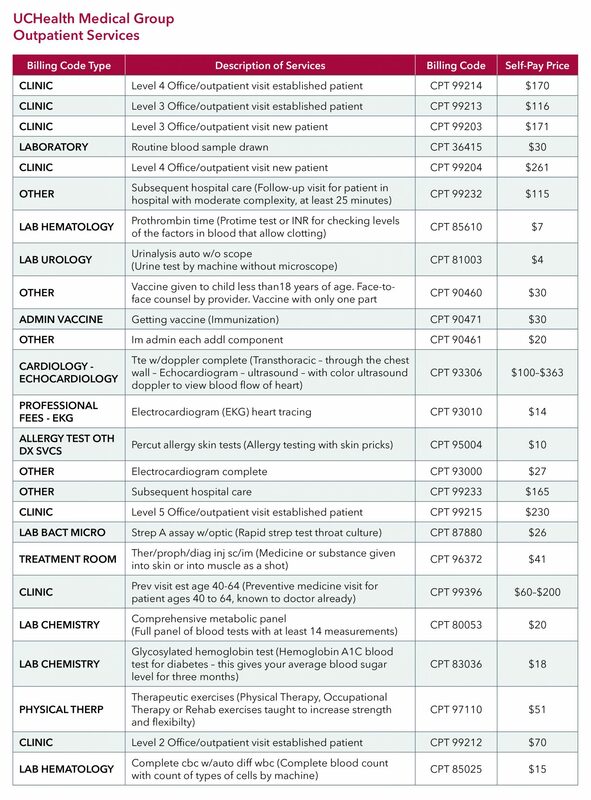 When a patient visits an emergency department, facilities charge an emergency department fee to pay for the patient’s care. 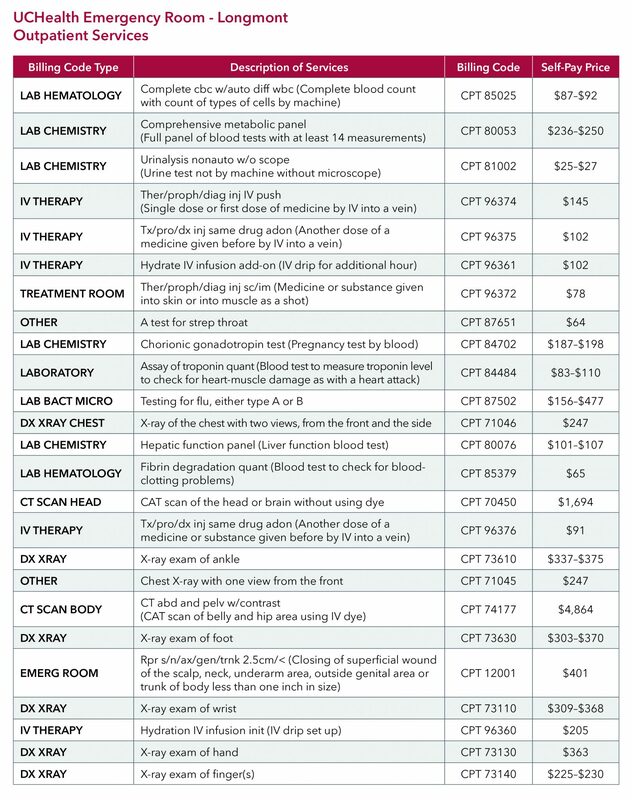 This fee provides for the nurses, staff, pharmacists, security, equipment, and other things the patient needs in the ER as well as the cost of keeping these services available 24 hours a day. 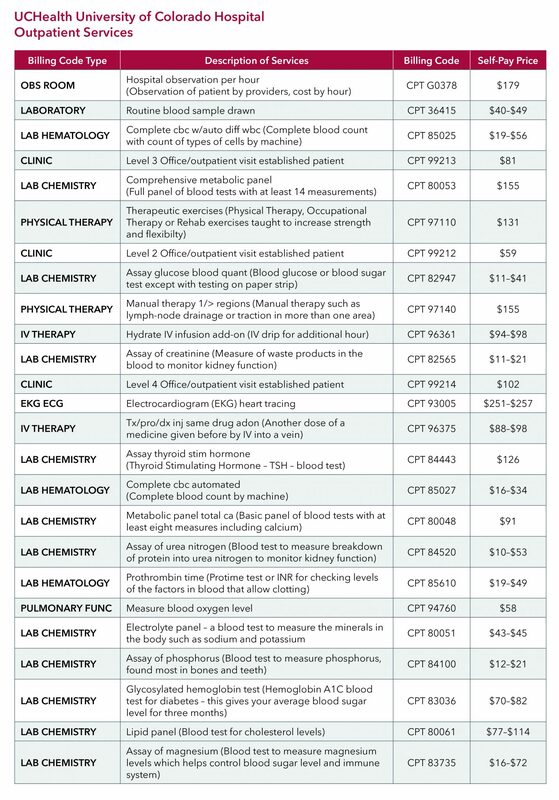 The fee does not provide for the doctor or additional tests and treatments. These are billed separately. UCHealth follows American College of Emergency Physicians guidelines for emergency department coding. Patients who need a higher level of care will be charged a higher facility fee. 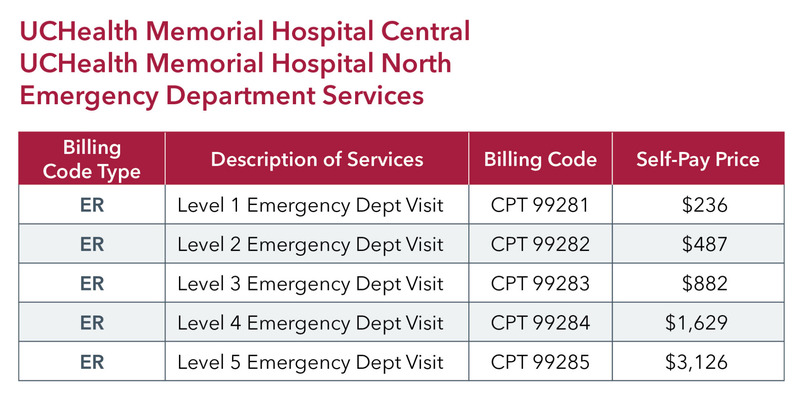 A level 1 or 2 emergency department fee might be charged for a very minor or simple condition like a minor viral infection or minor skin rash that requires little to no time in an ER, no tests or treatments and no prescription. Often, these conditions can be best cared for in an urgent care or primary care location. 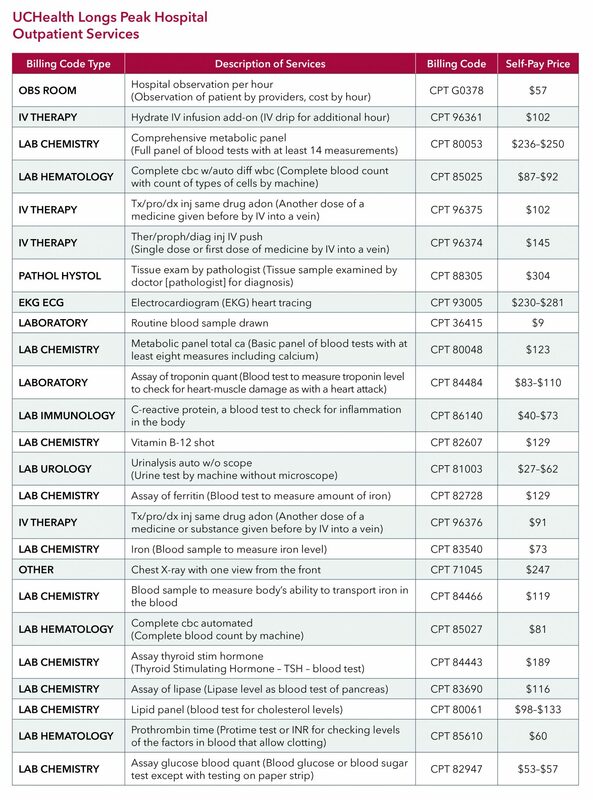 A level 4 or level 5 emergency department fee may be charged for a medical condition that requires multiple tests and screenings to diagnose and/or complex care to address. 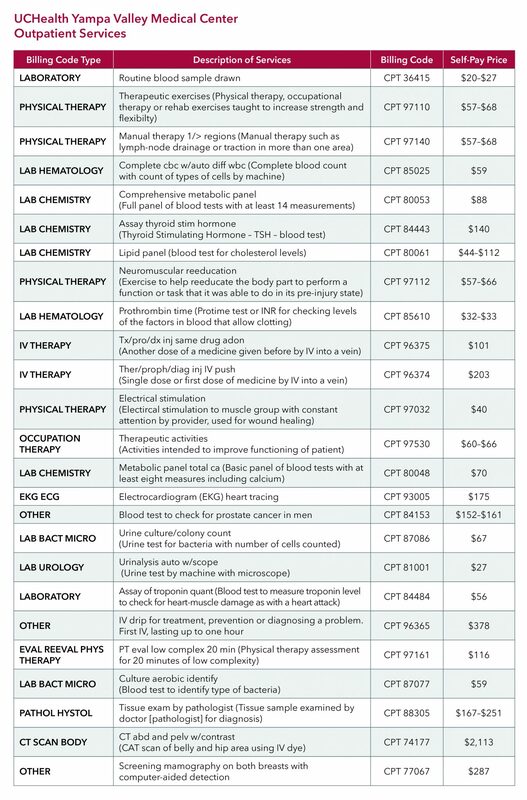 Codes and prices represent the care, tests and treatments needed by the patient, not the resulting diagnosis. For example, a patient who has a serious headache might need advanced care and screenings to rule out a stroke or other potentially serious or life threatening conditions and thus be assessed at a level 4 or level 5, even if the resulting diagnosis is minor. A patient who presents with chest pain might need tests and screenings to rule out a heart attack and receive a level 4 or level 5 bill even if he or she is determined to not be experiencing a heart attack. 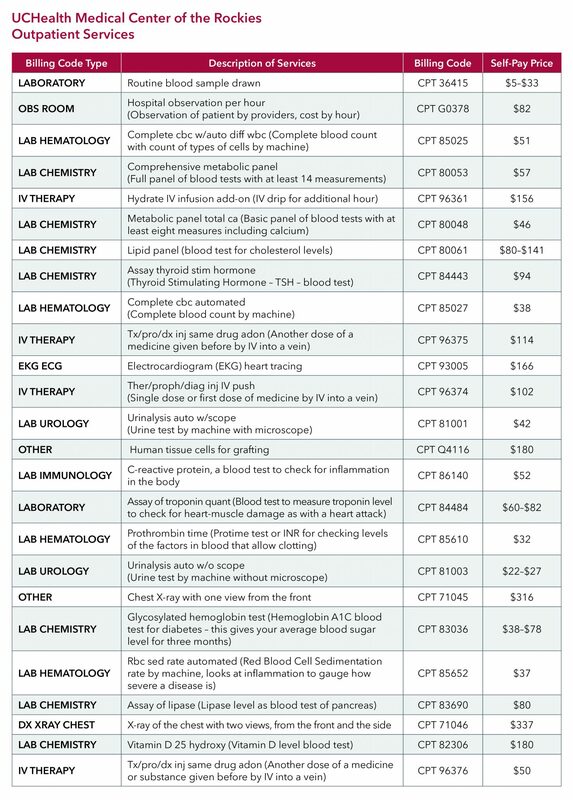 The federal Emergency Medical Treatment and Labor Act (EMTALA) requires that we provide a medical screening examination to rule out an emergency medical condition, and provide stabilizing treatment if one does exist, to all patients who come to the emergency department, regardless of their ability to pay or their insurance status. 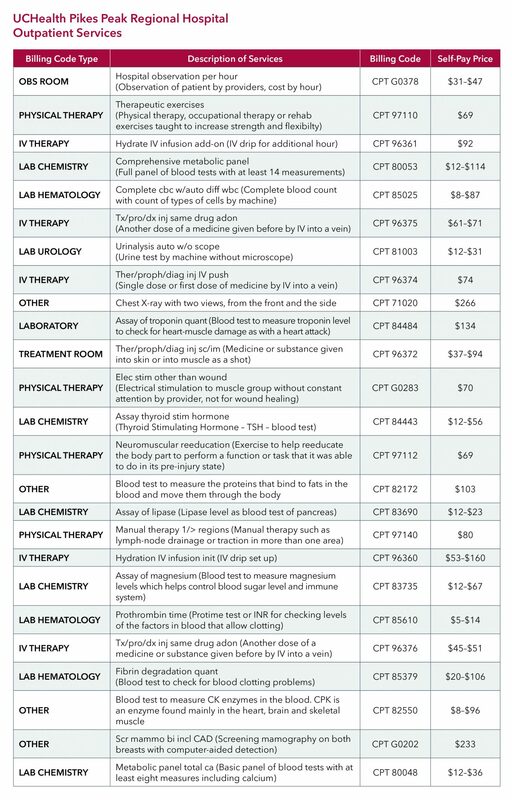 Codes and prices represent the care, tests and treatments needed by the patient, not the resulting diagnosis. For example, a patient who has a serious headache might need advanced care and screenings to rule out a stroke or other potentially serious or life threatening conditions and thus be assessed at a level 4 or level 5, even if the resulting diagnosis is minor. 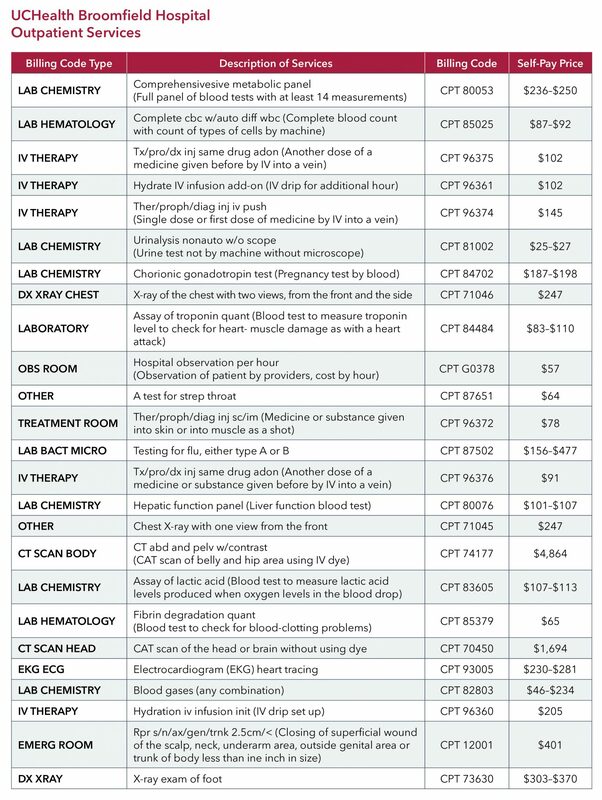 A patient who presents with chest pain might need tests and screenings to rule out a heart attack and receive a level 4 or level 5 bill even if he or she is determined to not be experiencing a heart attack.The federal Emergency Medical Treatment and Labor Act (EMTALA) requires that we provide a medical screening examination to rule out an emergency medical condition, and provide stabilizing treatment if one does exist, to all patients who come to the emergency department, regardless of their ability to pay or their insurance status. 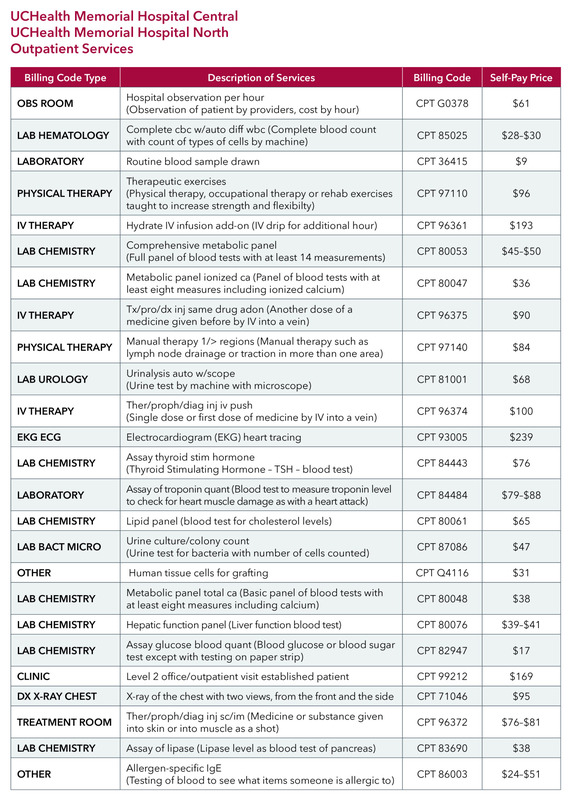 Codes and prices represent the care, tests and treatments needed by the patient, not the resulting diagnosis. For example, a patient who has a serious headache might need advanced care and screenings to rule out a stroke or other potentially serious or life-threatening conditions and thus be assessed at a level 4 or level 5, even if the resulting diagnosis is minor. A patient who presents with chest pain might need tests and screenings to rule out a heart attack and receive a level 4 or level 5 bill even if he or she is determined to not be experiencing a heart attack. The federal Emergency Medical Treatment and Labor Act (EMTALA) requires that we provide a medical screening examination to rule out an emergency medical condition, and provide stabilizing treatment if one does exist, to all patients who come to the emergency department, regardless of their ability to pay or their insurance status. 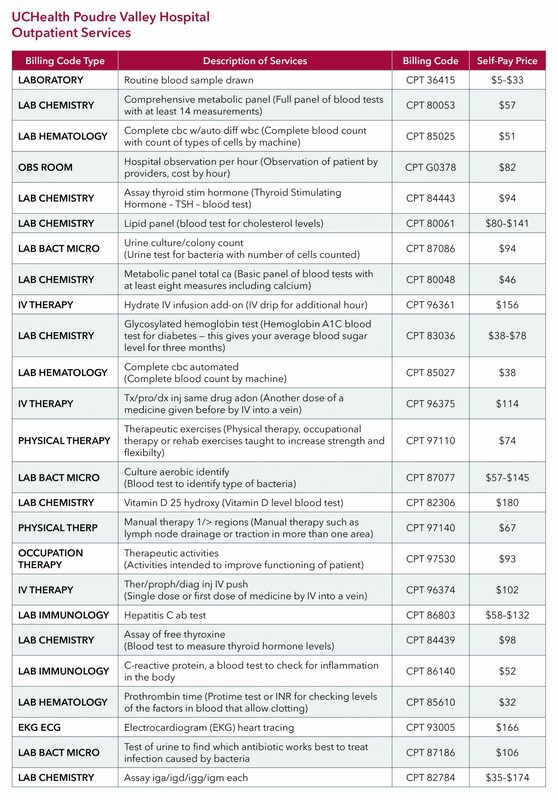 While the self-pay pricing information posted on this site is a good faith estimate of prices, UCHealth cannot guarantee the accuracy of these prices. 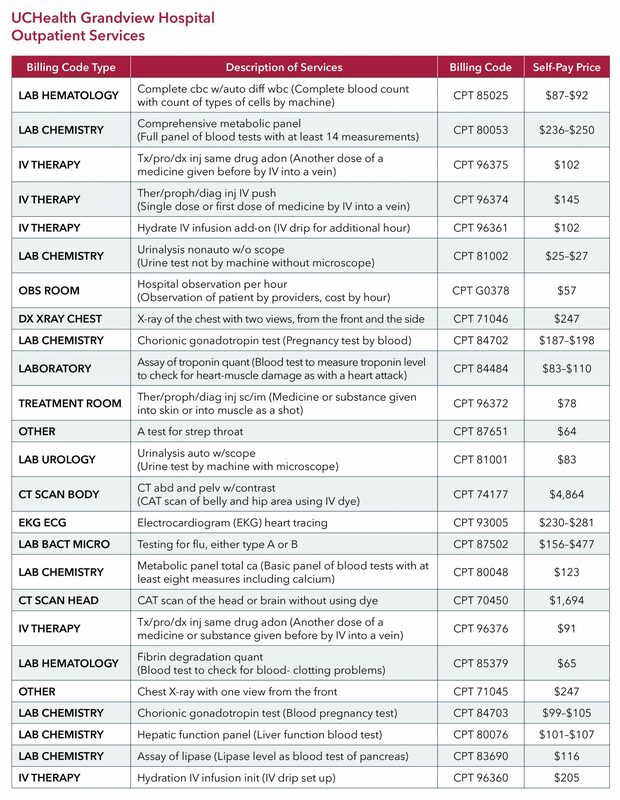 Prices are based on modeling of a range of patient visits and do not account for any unforeseen complications, additional tests or procedures, medical provider bills, and non-hospital related charges, any of which may increase the ultimate cost of the services provided. Any prospective patient should understand that a final bill or bills for services rendered may differ substantially from the information provided by this website, and UCHealth shall not be liable for any pricing disparities. 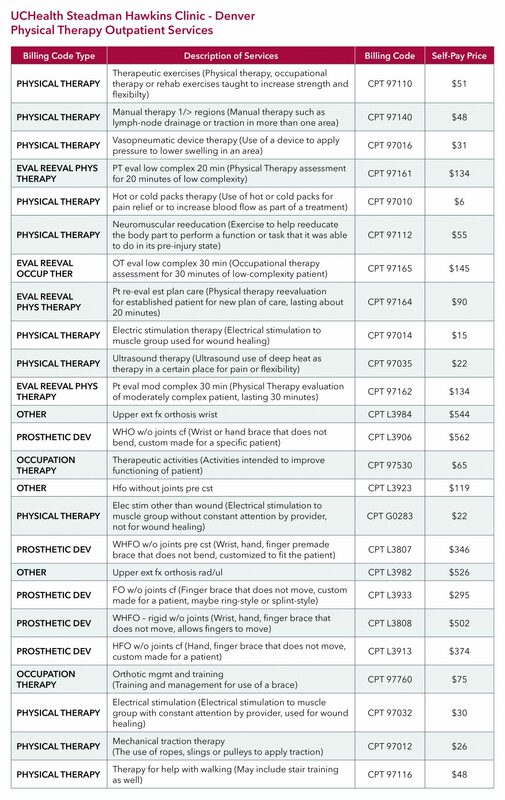 All pricing is facility-specific and not transferrable to other facilities.